Bethel Music has grown into a significant worship movement all across the world. The online audience for this movement consists of more than 167 MILLION views on YouTube, 1.5 MILLION likes on Facebook, nearly 500,000 followers on Instagram and over 150,000 Twitter followers. In addition, Bethel Music has more than 1.1 MILLION monthly listeners on Spotify. Their previous radio singles "No Longer Slaves", "You Make Me Brave" and "It Is Well" have combined for more than 35 MILLION streams on YouTube and more than 20 MILLION streams on Spotify. The audience for these songs is incredibly strong. 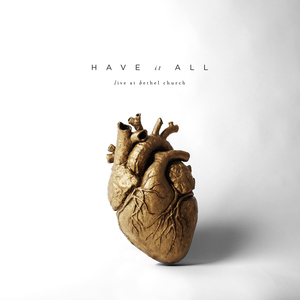 "Have It All" was inspired by Matthew 10:39 which says "Whoever finds his life will lose it, and whoever loses his life for my sake will find it." Bethel Music’s Brian Johnson shares below in the Song Stories video about overcoming a mental breakdown and struggling with severe anxiety. The Lord spoke to him about surrender through this challenging process. Surrender is not just going down to the altar and giving our lives to Him, surrender is in the details— it’s being vulnerable with Him in every moment of our lives.